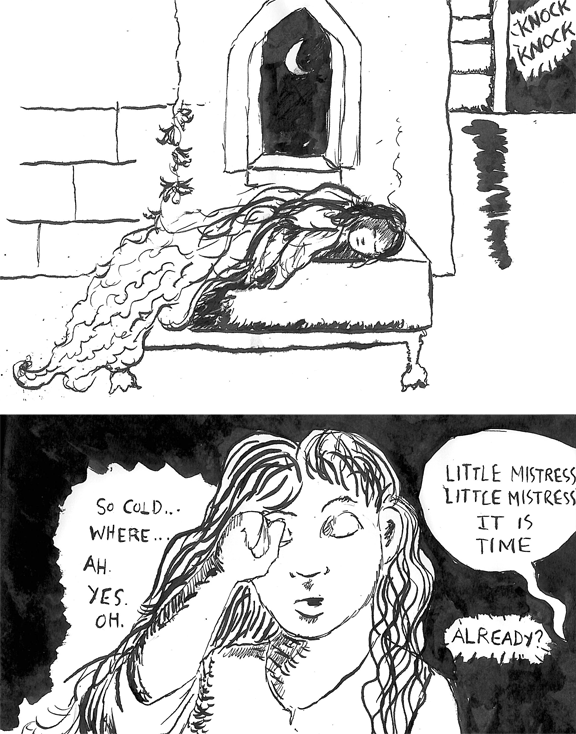 Panel 1: A girl is asleep in a medieval tower. There is a knock at the door. Panel 2: The girl rubs her eyes. Girl: (thinking) So cold...Where...Ah. Yes. Oh. Voice from offscreen: Little Mistress, Little Mistress. It's time. 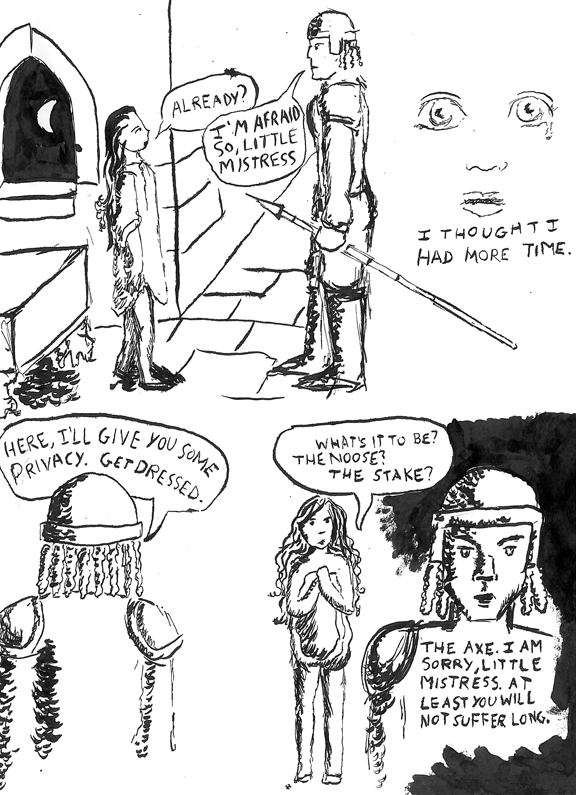 Panel 3: The girl, in a nightshirt, faces a man in armor with a long spear. Man: I'm afraid so, Little Mistress. Panel 4: Girl's face, up close. There is a tear in her eye. Girl: I thought I had more time. Man: Here, I'll give you some privacy. Get dressed. Panel 6: The girl is undressed,holding her nightshirt up to cover herself. The man is still facing away from her, but because of the composition of the picture, we see his face. Girl: What's it to be? The noose? The stake? Man: The axe. I am sorry, Little Mistress. At least you will not suffer long. Panel 7: The girl pulls on a shift over her head. Girl: My fifteenth birthday is tomorrow. I had hoped I might live to see it. Panel 8: The man's face, in profile. Man: I am loath to tell you, but your husband has gone before you. Panel 9: The girl brushes her hair. Girl: Don't be! Had I known he were so much a traitor, I would not have married him. Panel 10: The girl braids her hair. Girl: I went to his bed expecting to lose my maidenhood, not my NECK. Panel 11: The girl stands straight, fully dressed, hair braided. Girl: There. Done. I can stall no longer. Panel 12: The man faces the girl. Man: Everything is in order, then? Said all your goodbyes, Little Mistress? Girl: Yes. Wait. Wait. Wait. No. Panel 13: The girl faces the window, where the sun is breaking over an empty field. 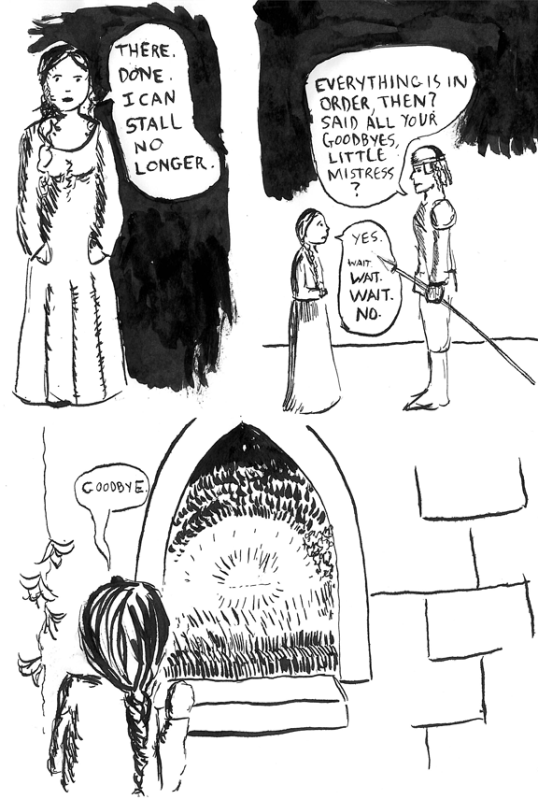 This comic was drawn freehand with India ink, a paintbrush, and a metal nib dip pen on heavyweight drawing paper. --Leave everything as it is. If the ink spatters, it stays. Clumps stay. All mistakes stay on the paper. The nature of this kind of art is both permanent and ephemeral. In a single moment, a perfect line can be marred with a splatter, a smudge, a miscalculation or a twitch of the hand. Each incongruity is a tiny tragedy but also a remembrance of the humanity behind the line. This post is for therealljidol topic 4, Devastating Beauty. Please feel free to read and comment whether or not you are in the competition. This isn't part of the entry, officially, but deutscheami reminded me of this so I thought I would add it in for those of you who might be interested. 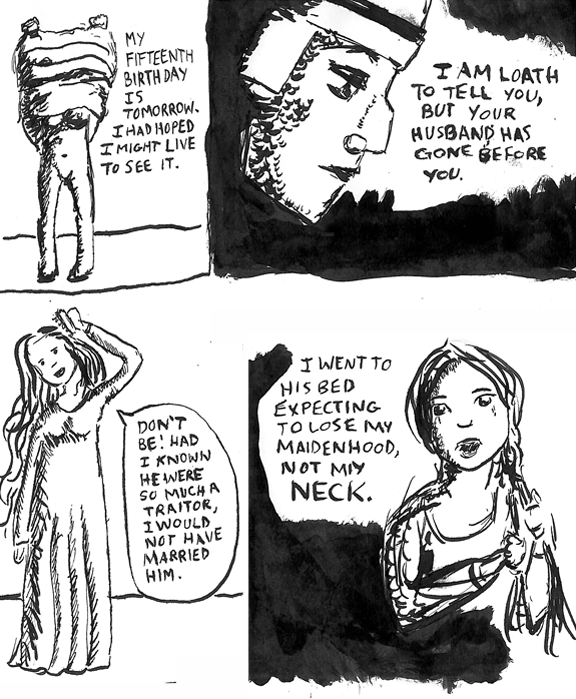 The idea for this comic came from the last line of a set of song lyrics I wrote for a fictional opera (that I wrote for an opera-singing roleplaying character whom some of you might know of). The lyrics are kinda trite (be gentle, I wrote this ten years ago!) but the imagery worked for a comic. The last day of my life. bursts from far beyond the night. The stars fade from the sky. This sunrise is my goodbye. Wow, I really liked this. Wonderful comics as well. Usually your comics make me laugh. This one made me cry. But I guess that is what I was going for! I felt like I wanted to use the descriptive prompt as a way to experiment with an art style that fit the category as well as a topic. Loved this! I only wish I could see the art that you describe! Very original entry! Thanks! I had you and the other blind contestants in mind when I added the description of what the art style is like and my requirements for myself-- I thought that other folks could read into the art style what they wanted but I figured it was worth explaining what was going on on the paper in a technical way so you would know that this isn't the same as my other art. The inking style I used actually makes the paper wrinkle and leaves thick layers on it that you can feel-- I wish there was a way to transmit that over the internet, it would be awesome if you could touch it! Good for you, tackling a new medium and one as hard as a dip pen. For further challenge, try a brush. They take longer to be proficient with but the results, at least for me, are well worth it. The only questions I have are why you decided not to allow yourself pencils and why no reference images? Viva ink! I used a brush to do the larger black areas and some of the wider lines! This was for a challenge prompt, and the prompt was "devastating beauty" so I felt like putting myself in a position where I had to work with my mistakes would make the actual process of creating the images fit the prompt in addition to the subject matter I chose. I think this might be one of my favorite things you've done. It's got so much story that isn't told, but it's really compelling because of that. It makes me wonder about what happened before and what happens after. Wow, really?! Thank you so much-- I know that from you that is a serious compliment. I was worried I didn't put enough information in here for the story to be clear so I'm glad to hear that it's enough for you! I like this a lot-- to me, the style calls back to the art you did during DOTG/Shiver, and I love seeing that older style influencing your current art. Oh! That is interesting because I don't know if you were in DotG when it happened, but I got the idea for this from one of the fictional opera roles that Aiko played, which was a child queen who was executed because her husband was overthrown in a political coup. I had this song Aiko used to sing about her waking up on the morning of her execution and I used that as the premise for the comic! With a couple changes! Ooh that's beautiful. It reminds me of Lady Jane Grey, when I was looking at it I thought that might be who it was based on, but then, I did recently read Alison Weir's Innocent Traitor (which is fantastic) and so maybe it was just in my head. Oh, and, of course, thanks! Absolutely beautiful. I loved seeing a different kind of "comic" from you this week - most are jovial, this one was deep. I also love that you used the nib pen method for the different style. It really set it apart. Thank you! I didn't always write jovial comics; this is a new thing for me (relatively speaking, of course). So this is sort of a return to form! I was really pleased that the ink drawings didn't take any longer than the usual comic style, and it's fun to use a medium you can't force into submission. my favorite panel is "i went to his bed expecting to lose my maidenhood, not my neck", and also, all of it. Thank you! I wasn't sure to keep that in there because I was wondering if it was too snarky for a story about someone about to be executed. I actually really like those lyrics. They're very believable as operatic (okay, yeah, I was one of those kids; on Halloween when I was 7 I went as the Queen of the Night from the Magic Flute and got pissy when no one knew what I was talking about) largely because of the way they are trite. And, you know, melodramatic. The composition on this comic is also really impressive. Yeah, it was one of those things where I was trying to emulate opera (this was for Aiko, of course), and I wanted to make it sound that way, but I feel like I need a disclaimer so people don't think I'm that schmaltzy normally! And thank you! I honestly was not paying much attention to the composition because I was just trying to work out how to use the nib! Thanks! I felt like the topic really loaned itself to finding a medium that expressed the topic!